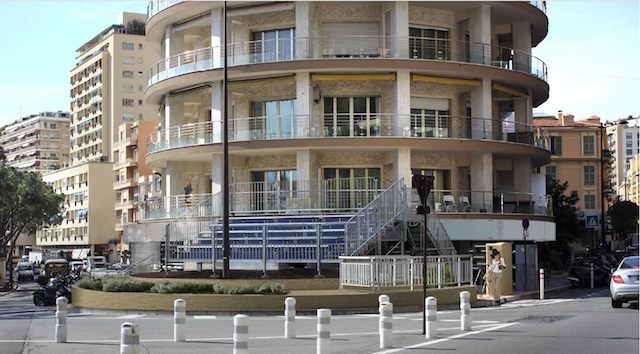 The iconic Ermanno Palace apartment building is located at the end of the start-finish straight – Boulevard Albert 1st – on the world-famous Sainte Dévote corner, ‘Turn 1’ of the famous Monte Carlo street circuit. This is generally accepted to be the most exciting corner of the circuit and is guaranteed to offer exciting racing action. The Grand Prix organisers Automobile Club de Monaco voted the Ermanno Palace as offering …. 'the best view of the Monaco Grand Prix'…. Our garden terrace replaces the grandstand seating (as shown in the picture above) of previous years. You will have complete freedom to enjoy our garden area overlooking the track towards the start / finish straight, for the ultimate view step onto our raised terrace to see the cars hurtle into Turn 1 and exit up the hill towards casino. Map showing the location of the garden terrace at the heart of Monaco and the race ….